R. S. Dugan discovered the seventh largest asteroid, #511 Davida, which is estimated to be either the fifth or sixth most massive asteroid. H. E. Wood discovered asteroid #1032 Pafuri. A Hermes II test mission was launched from White Sands Proving Ground (WSPG), New Mexico, which achieved an apogee of 79.3 km, but was considered a failure, crashing in Mexico. The Hermes II (B-1), launched 29 May 1947 from White Sands, impacted a graveyard 18.5 km south of Juarez, Mexico on its first test flight. This, and the out-of-range V-2 impact on 15 May, resulted in new safety measures at WSPG. One of the researchers has been reported as making the tongue-in-cheek observation "We were the first German unit to not only infiltrate the United States, but to attack Mexico from US soil." The Hermes II was deeply classified at the time, a series of experiments conducted using modified V-2 rockets to test the configuration of a ramjet propulsion system. Four Hermes II rockets were flown from Complex 33 at WSPG, none of which were noted in the contemporary records. USSR's Luna 10 transmissions were terminated. NASA launched Surveyor 1, the first US probe to achieve a soft landing on the Moon. ESRO 2A was launched from Vandenburg, California, using a Scout 55 rocket, and carried 7 experiments to study solar and cosmic radiation. The third stage vehicle failed to ignite and the spacecraft did not achieve orbit. USSR launched Cosmos 222 into orbit from Plesetsk for investigation of the upper atmosphere and outer space. 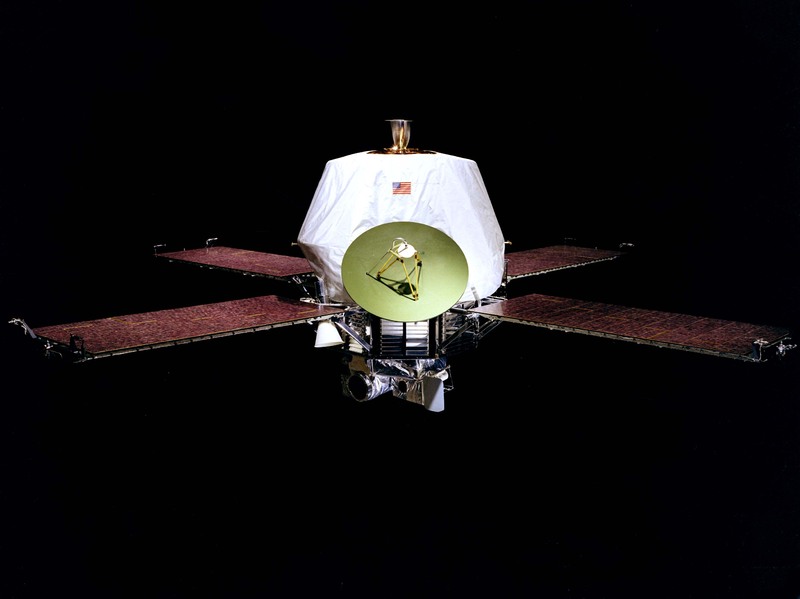 NASA launched Mariner 9, the first spacecraft to orbit another planet (Mars). NASA launched Applications Technology Satellite 6 (ATS-6) into geosynchronous orbit for educational programming. ATS-6 was an experimental communications satellite, and also conducted a Cesium ion engine test. USSR launched Cosmos 741, a Zenit-2M (area survey photo reconnaissance) satellite used for Earth resources studies as part of 'Gektor-Priroda' project. USSR launched Cosmos 1655 from the Plesetsk cosmodrome, part of a 6-satellite Soviet military navigation system distributed in orbital planes spaced 30 degrees apart. In the first launch of ESA's Ariane 2 booster, the third stage had a partial ignition followed by another ignition above nominal pressure leading to engine failure. The rocket was destroyed by range safety, resulting in the loss of Intelsat 5A F-14. USSR recovered Soyuz TM-1 after its successful unmanned test flight to the Mir space station. USSR launched Cosmos 1950 from the Plesetsk cosmodrome aboard a Tsyklon 3 rocket, a Soviet geodetic satellite that provided five ways for determining satellite position. USSR launched the Progress M-8 resupply vehicle from Baikonur to the Mir space station, which also released the Naduvaniy Gazovoy Ballon subsatellite. Progress M-8, launched 30 May 1991, was an unmanned resupply vessel sent to the Mir space station. It docked with Mir on 1 Jun 1991 at 09:44:37 GMT, undocked on 15 Aug 1991 at 22:16:59 GMT, and was destroyed in reentry on 16 Aug 1991 at 06:56:32 GMT. Total free-flight time: 2.43 days. Total docked time: 75.52 days. Yuri Onufriyenko and Yuri Usachyov performed the 4h 20m Mir EO-21-4 EVA at the space station to install a multi-spectral scanner. China launched the Zhongwei 1 (China Star 1) communications satellite from Xichang into geostationary orbit. Zhongwei 1, also known as Chinastar 1, was launched 30 May 1998 from Xichang, a communications satellite to serve China, India, Korea and Southeast Asia with 18 C-band and 20 Ku-band transponders. It was operated by the China Orient Telecommunications Satellite Company, part of the Chinese telecommunications ministry. Zhongwei 1 and the Chang Zheng 3B (CZ-3B) final liquid hydrogen upper stage were placed in an initial supersynchronous 216 x 85,035 km x 24.4 deg transfer orbit for a geostationary slot at 87.6 degrees E longitude. Zhongwei 1 was positioned in geosynchronous orbit at 87 deg E in 1998-1999. As of 6 September 2001, it was at 87.49 deg E drifting at 0.013 deg W per day. NASA astronauts Tammy Jernigan and Dan Barry entered the payload bay of the space shuttle Discovery from the tunnel adapter hatch to begin EVA STS-96-1. During the space walk, they transferred equipment to the exterior of the ISS. August Friedrich Staats (27 October 1913 - 30 May 2002) was born in Bremen, Germany. He received his first patent, for an electro-acoustic remote control system, when he was 21 years old. During World War 2, he worked under Dr. E. A. Steinhoff at Peenemuende, developing radio control, guidance, and telemetry systems. He chose to remain in Germany after the war, and became the lead engineer for the United Acetylene Factory in Hannover. On 21 September 1952, he and 11 other engineers founded the German Society for Rocket Technology ('Arbeitsgemeinschaft fur Raketentechnik' - DAFRA, later known as the German Rocket Society - Deutsche Raketengesellschaft - DRG, and finally as - Hermann-Oberth-Gesellschaft - HOG) in Bremen as soon as the Allies removed the prohibition on German aerospace research. During his long tenure as President of the Society, the twelve founding members grew to an organization of 1300 in 14 countries by 1963, and the Society conducted pioneering sounding rocket experiments at Cuxhaven. Staats founded the magazine Astronautik and served as its Chief Editor. He also founded and led a series of International Spaceflight Congresses in Salzburg. In 1990, he stepped down to Vice-Presidency of the HOG, which merged into the current Deutsche Gesellschaft fuer Luft- und Raumfahrt - Lilienthal - Oberth eV (DGLR) in 1993. He received numerous honors, including the Gold Medal of Salzburg, the German State Service Cross First Class, an honorary doctorate from the University of Barcelona, and the Wernher von Braun Medal of the DGLR.